Schools of Blue Striped Grunts frequent Hol Chan. Dr. Jacque Carter is a Research Fellow with Wildlife Conservation International (WCI), the New York Zoological Society's global field research program. WCI is supporting 82 endangered species and habitat projects in 34 countries. For more information on WCI, write: WCI, NYZS, Bronx, NY 10406 USA. 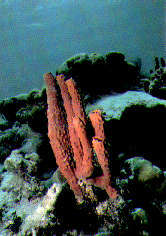 Chimney Sponges add color and beauty to the marine environment. Special thanks goes to Archie Carr 111, WCI/NYZS, for his support of CEDAM International's conservation efforts. Our thanks also goes to Janet Gibson for her dedication to the development of the Hol Chan Marine Reserve. We also appreciate the efforts of our editorial advisor Robert M. .Sammon for his input on this guide. Photographs in this guide were taken by Rick Sammon on Fuji film. 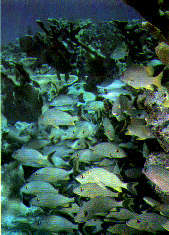 For several years, leading conservation groups worked to set aside the Hol Chan area, off Ambergris Caye, as an underwater park. 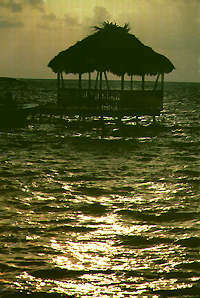 These groups included Wildlife Conservation International (WCI), a division of the New York Zoological Society (NYZS), World Wildlife Fund, U.S. Agency for International Development, the Peace Corps, the Belize Department of Fisheries (Ministry of Agriculture, Forestry and Fisheries) and the Belize Audubon Society. In 1986, CEDAM International became aware of a WCI/NYZS plan for the park. Shortly thereafter, we mobilized an expedition to Hol Chan in the hope of obtaining photographs for a guide book to this area. The expedition was directed by Dr. Carter of WCI. It was led by CEDAM International member Dale Moore. The photographs and data in this guide are a result of that expedition. The text was compiled from the WCI plan, written by Janet Gibson. We hope you enjoy your visit to Hol Chan. Safe Diving.